Chemical Engineering applies chemical, physical, and biological processes to convert materials to more valuable products or useful forms of energy. The role of a chemical engineer is to conceptualize, design, develop, control and operate those processes so that they are profitable, safe, efficient, and environmentally acceptable. Chemical Engineering education is unique for its strong emphasis on building-up the ability to apply a system's approach to problem solving, to synthesize useful results, to form productive partnerships with other professions, and to apply principles from a broad range of scientific disciplines. 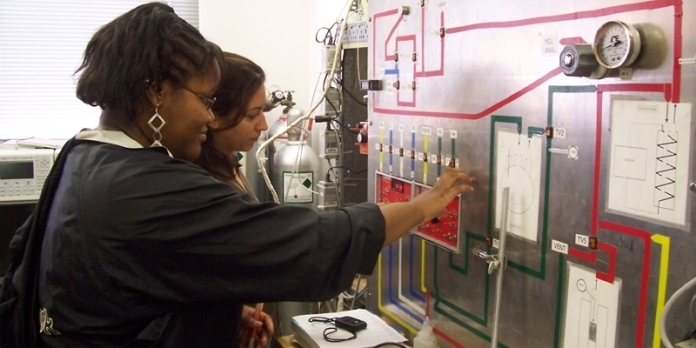 Completion of the undergraduate Chemical Engineering program at Hampton provides the basis for continuous professional growth or graduate studies in Chemical Engineering, and for admission to professional schools such as medical, law, or business. In addition to the Chemical Engineering laboratories, students enrolled in the program have access to three main computer labs (Lockheed Martin Modeling and Simulation Lab, Hewlett Packard Integrated Electrical Engineering Lab, and U.S. Department of Education Modeling and Simulation Computational Lab) and to the state of the art VPERC material characterization laboratory containing a scanning electron microscope, a high power optical microscope, an x-ray diffraction instrument, and other material characterization equipment. In addition to providing a thorough state of the art engineering education with personalized attention, the program also offers opportunities for undergraduate research experience. The program conducts funded research projects in several chemical engineering areas such as high temperature gas clean-up wastewater treatment and the production of liquid fuels from coal and natural gas. Moreover, the expertise of chemical engineering faculty members in research projects such as the Hampton University Aeropropulsion Center and the Eastern Seaboard Intermodal Transportation Applications Center provides opportunities for chemical engineering majors to engage in areas of hypersonic engine processes, onboard hydrogen generation, and modeling of pollutant transport from roadways. The mission of the Chemical Engineering program is to provide a comprehensive and competitive chemical engineering education following the guidelines provided by ABET. We are committed to serving as a conduit to a profession that has traditionally not been highly accessible to minorities. The Chemical Engineering program is formally structured into a four-year curriculum leading to the Bachelor of Science degree. The first two years are spent in a common core program required of all engineering majors. Upon admission to the upper program the final two years are spent fulfilling accreditation requirements outlined by ABET. This program serves students interested in developing the technical skill sets needed to conceptualize and design chemical based processes and in applying these skills to a broad range of areas, such as the environment and manufacturing, and to emerging topics at the intersection of engineering, chemistry, biology, and physics. The Chemical Engineering program offers courses that may be taken as electives by other engineering students. The faculty members teach courses in the general engineering and architecture (structures) areas and are active members of area and national professional societies. The Chemical Engineering program is accredited by the Southern Association of Colleges and Schools, the Department of Education of the Commonwealth of Virginia, and the Engineering Accreditation Commission of ABET. The program is a member of the Center for Chemical Process Safety of the AIChE, Safety and Chemical Engineering Education, supports the CACHE (Computer Aids for Chemical Engineering) Corporation.